PORTSMOUTH, Va. — The Navy and the Marine Corps are studying installing a vertical launch system in its San Antonio class of amphibious warships that would allow the ships to field larger offensive missiles, service officials told USNI News this week. The director of expeditionary warfare in the chief of naval operation’s office (OPNAV N95) told USNI News on Thursday both services were studying installing the VLS systems but that at the moment there was no program of record to back fit the capability into the hulls. 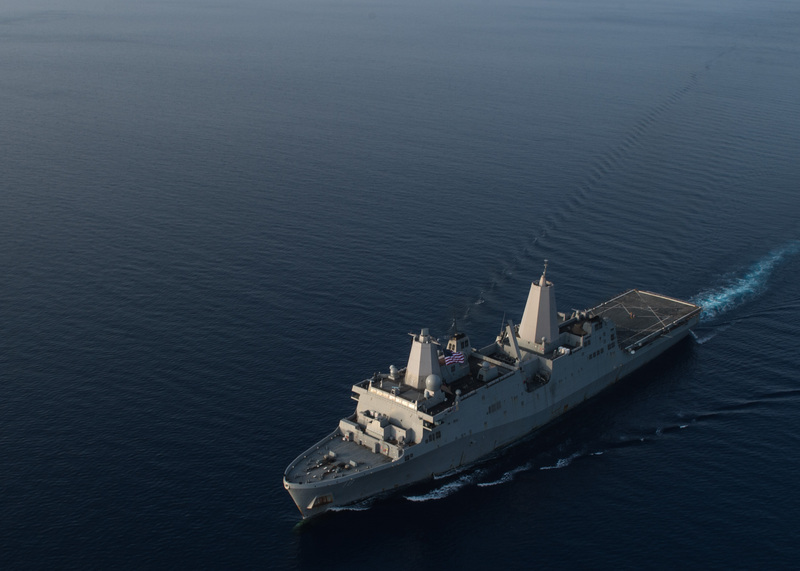 “It’s certainly an asset we’d like to have,” Marine Maj. Gen. Chris Owens told USNI News during the NDIA Expeditionary Warfare Conference in Portsmouth. The original concept for the San Antonio class included two 8-cell Mk 41 VLS in the bow of the ship. The VLS system was cut during development of first-in-class USS San Antonio (LPD-17) but USNI News understands within the last six months there’s been renewed interest in bringing the capability back to the class in both services. Currently, the only missiles aboard the LPDs are part of the ship’s defensive SeaRam close-in weapon system. “This is all in the Navy’s lane but we’re trying to have that discussion with them. We’ve always had the discussion of getting longer-range surface fire support,” Lt. Gen. Robert Walsh, commander of Marine Corps Combat Development Command (MCCDC), told USNI News on Tuesday at the conference. The move could provide Marines ashore more options for fire support from the sea, a capability the Marine Corps has long wanted from the Navy since the final retirement of the four Iowa-class battleships in the 1990s. 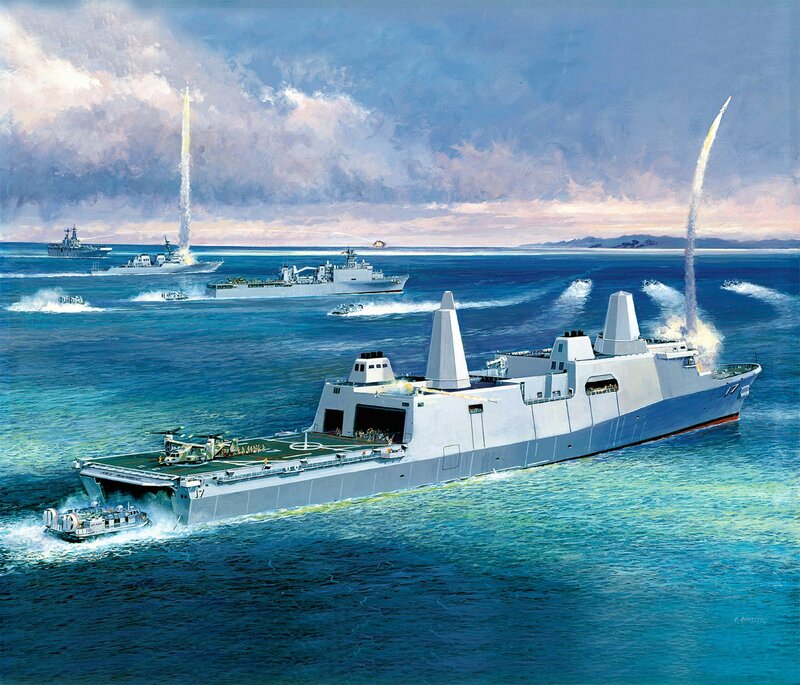 The Zumwalt-class of guided missile destroyers (DDG-1000) was intended to fill in the naval surface fire support gap with its 155 mm Advanced Gun System firing the Long Range Land Attack Projectile (LRLAP) but the class was cut to three ships. Other efforts to field long-range guided rounds to be fired from the services 5-inch guns on its destroyers and cruisers capable of providing surface fire support either stalled or were canceled. There is promise in using the hyper velocity projectiles (HVP) developed for the service’s electromagnetic railgun from 5-inch guns as a long range guided round suitable for several roles – including naval surface fire support – but testing to integrate the rounds aboard warships could take more than a decade, USNI News understands. At a minimum, 16 cells on an LPD could give a three-ship Amphibious Ready Group space to add Tomahawk Land Attack Missiles that could support Marines ashore with little modification to the amphib’s combat system. Additional types of missiles that could fit in the Mk 41s – like the anti-air Standard Missiles and the Evolved SeaSparrow Missile (ESSM) – would likely require more work and may need more sensors and more money to work on the LPDs. However, according to Walsh, both services are examining a host of possibilities. “It may be a Tomahawk capability — whatever capability you could put into those tubes we’re looking at,” he said.